I saw Anthony’s Swanlights, from the Anthony and the Johnsons fame a couple years ago. When the performance ended, I saw many people in tears. Then the crowd, in a mounting 15 minute standing ovation begged Anthony to come back on stage and failed. Anthony is a unique music legend and a familiar face to many New Yorkers. I first heard of him about 10 years ago from a friend. She pointed me to a shy and slightly awkward character sitting at Think Coffee on Bleecker and Bowery and told me his name. Despite having a song on the Hunger Games soundtrack, Anthony is not widely known or identifiable by the general public. Marina Abramović doesn’t seem to need an introduction. Nevertheless, her performance and, to an even larger extent, her life, are completely unknown to the general population. Many have heard about her for the first time during The Artist is Present. There’s also a documentary by the same name. My favorite Willem Dafoe performance is in Boondock Saints. It’s a cult movie, yet somewhat niche. Dafoe is a brilliant actor and he puts immense efforts into being his characters. These three individuals came together in a performance entitled The Life and Death of Marina Abramović at the Park Avenue Armory. The critics wrote that “its performers are excellent, the production is stunning, and the play itself is awful”. They complained that “if you were to go see this show, and you didn’t know much about Abramović, you would walk away without the least idea of why her death matters”. I think that the idea that you can watch such a show without any background or research is sad. We’ve become so accustomed to consuming media without any preparation, much like television. We don’t read. We don’t learn. It quickly becomes obvious that we have nothing to talk about, either. And it’s no wonder that we compare contemporary paintings to works of children. Me? I loved the show. I’ve followed of all these individuals and their art for years. Same probably goes for everyone sitting around me, including Lady Gaga who was a mere 10 seats away in a glittery white dress. We all stood together and applauded in the end a magnificent Dafoe. He delivered a continuous and intense narrative and was incredible. He looked like a wreck and carried the entire show on his frail shoulders. Marina and Anthony appeared occasionally, and created unique and complex feelings. The Serbian chants penetrated your body. Robert Wilson’s adaptation of the artist’s life was sometimes heavy and, of course, always beautiful. Marina’s life and death matters, but it doesn’t have to matter to everyone. 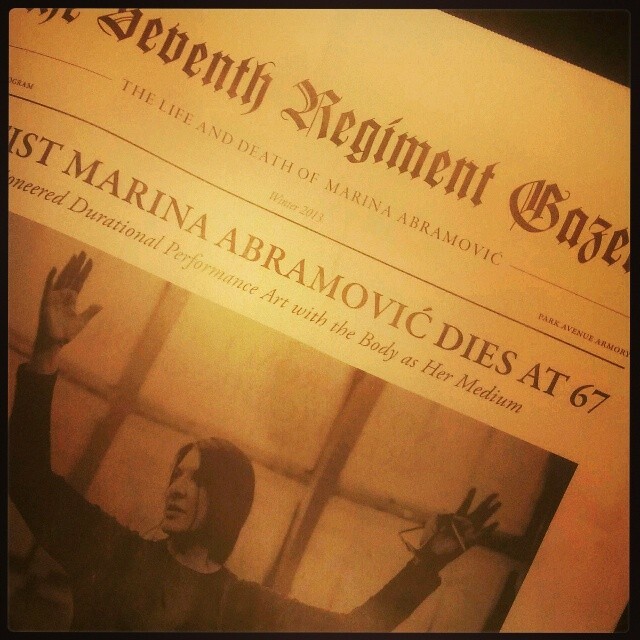 The Life and Death of Marina Abramović was published on December 24, 2013 .